Sonnyjim brought a sack of peng to the Suspect Packages bunker this month, so no interview this time around. You still get Disorda's choice picks and Sonny, who's got to be one of the best on the circuit right now, does the damn thing. 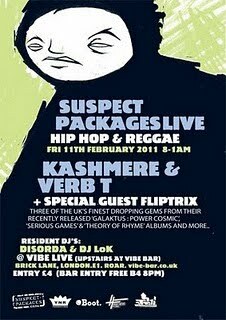 And don't forget to hit up Vibe Bar this Friday to catch Verb T and Kashmere at SP Live.